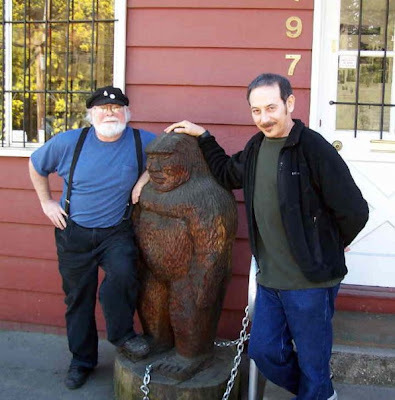 We just got off the phone with the MK Davis regarding his White Bigfoot Video. We wanted to learn little bit more about the how the tapes came to him and nature of the recordings themselves. We learned the tapings were part of a four-year project producing over 50 six-hour VHS tapes (that's 300 hours). MK has had them for about six months and has digitally transferred the VHS tapes himself. These videos are taped on a land that was initially purchased because the current owner was looking for Indian artifacts, like arrow heads and what have you. Eventually he kept coming across large prints and tracks and wanted to know what could be making them. With the help of some tech-savvy people they set up cameras. These cameras were set up to continually film, no infrared triggers, no motion detectors, just continuous taping. More interesting is what you see is not the direct view of the camera, each lens was pointing to an angled mirror. 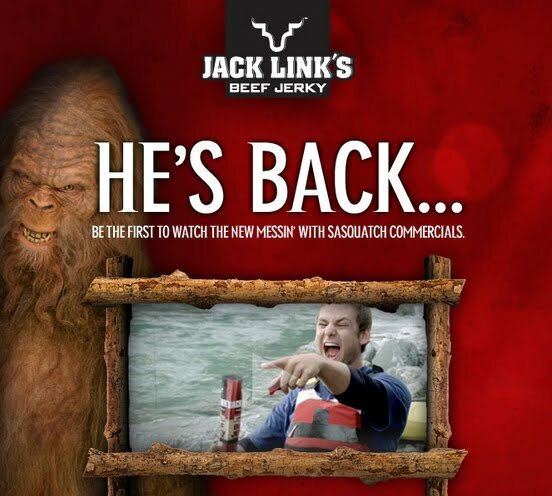 This was to overcome the theory that Sasquatch are quite aware of cameras and purposely try to stay out of the line of sight. When we brought up our arguments about a possible cow or ungulate, MK Davis was adamant in denying the possiblility. 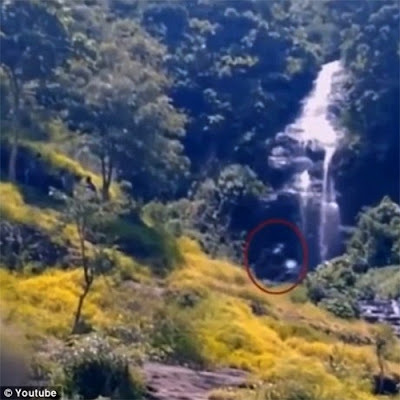 "Its definitely not a cow or an ungulate, I'm pretty sure of it because I got better pictures of it next to the creek"
We asked about the dark pixelations that seemed to lead the alleged Sasquatch and he had agreed that he had seen that too and says his better picture also show the Sasquatch has a dark face. 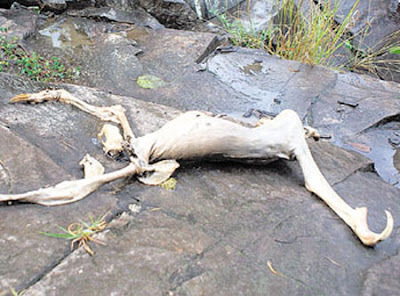 He continued to describe other oddities,"When it walks upright it almost looks like it is sitting in a chair, there's nothing underneath it--you could put a chair underneath it, but it just moves around with its knees bent almost at a 90 degree angle. Also, in the video it never runs, [one foot is always in contact with the ground] its actually walking that fast!" 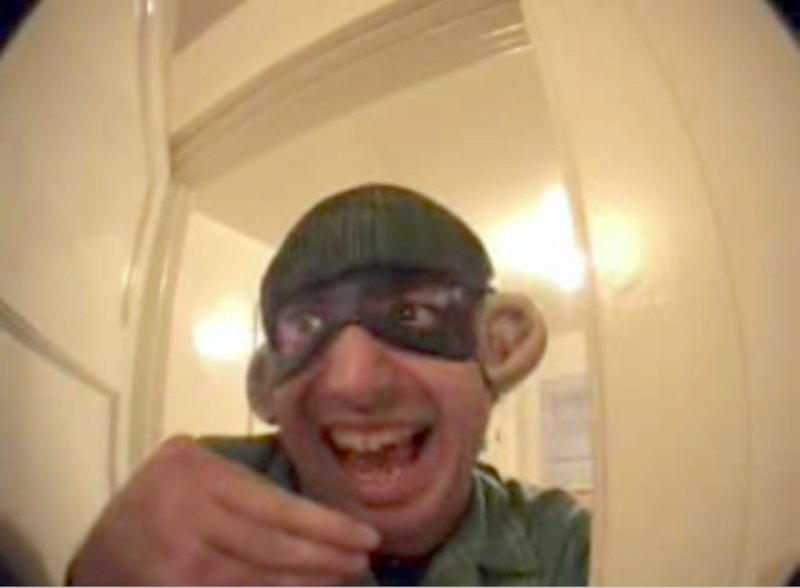 The video below was uploaded to show a bipedal figure from the same footage. MK Davis is certain he can rule out a cow, sheep or any other type of ungulate. MK also noted the part that intrigued him most about theWhite Bigfoot video. "The thing that got me was when it was on all fours the way the hind leg kicked up, I had seen that before. When I was in Louisiana I saw, point blank, something run right in front of my vehicle on all fours. It did the same exact thing, the hind legs almost reach all the way up to the head and then extend." Over the phone MK shared some interesting audio that we hope he will share soon. 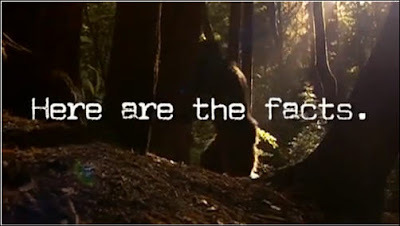 The audio samples were similar to other familiar alleged Sasquatch sound sounds, the Samurai Chatter, a groan that will make your ears bleed (at the very least make your skin crawl), and some possible conversation between two individuals. MK has uploaded another video (see below) that he uses to do a size comparison. In our mind it is not as compelling as the audio we heard. 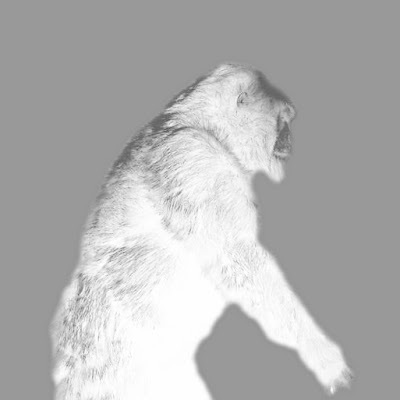 By the way light-colored or blond Bigfoot are not unheard of you can read our post, "Rise of the Blonde Bigfoot" to read about them more. and gait to the alleged light-colored Bigfoot in the MK's video analysis. We did the rough animation above after seeing MK Davis's video at Bigfoot Evidence. The video M.K. 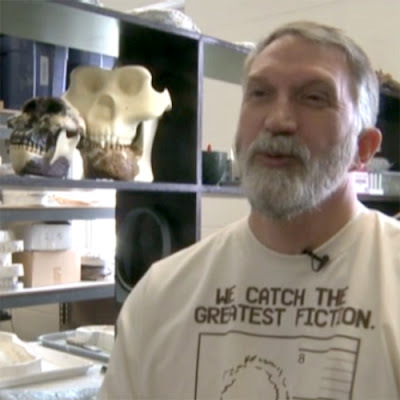 Davis released shows a possible light-colored Bigfoot. The gait to us looks like gallop with half the information missing, as if the legs in the background are dark. Dark enough to blend into the background. In MK's Video we see a leading head that seems darker than the rest of the body. This would also take into account two distinct moments MK points out; the hind legs kicking up, and the portion MK refers to as the "big step". isolated is too close to a tree and may hide any suggestion of a head. 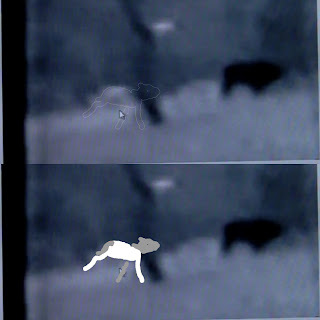 Its all very hard to determine, but the white blob in our animation looks similar to the movement in the video to us. We would love to hear what you think. Please, feel free to shoot holes into our theory in the comments below. Obviously we always want it to be Bigfoot, but we see a gallop happening, not a bipedal gait. We have contacted MK Davis and asked him to weigh in. Here is MK's video analysis below. We had seen this video as an ipod podcast and wanted to share it with you guys its done really well. 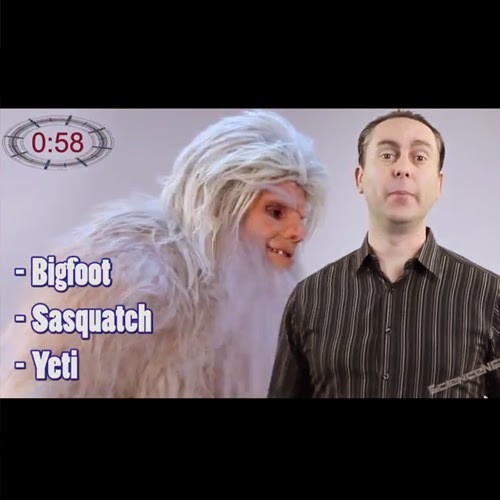 Fortunately, the folks at BigfootHub.com found the YouTube version. Here is their post verbatim. We stumbled across this video on YouTube and wanted to share it with all of you. 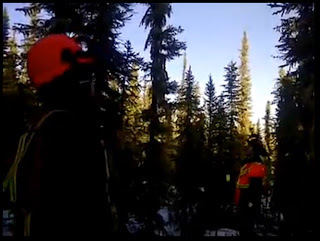 In 3 ½ minutes, this video pretty much sums up all the theories surrounding the Sasquatch phenomena in North America. Regardless of which camp you sit in, it's interesting to watch this and realize that lots of people believe lots of things about Bigfoot. As always, we let our readers decide for themselves.